Canine Paws-Abilities, LLC is a Fear-free dog training and animal behavior company owned and operated by Kathy Rice, M.A., CPDT-KA. Kathy has spent the last 22 years working as a Speech Language Pathologist and Regional Director of Operations. Her experience ranges from specializing in early intervention, language acquisition to rehabilitation with the adult and geriatric population. It was a natural transition into Professional Dog Training. Her knowledge and expertise in human communication was a perfect bridge into reading and understanding canine communication and body language. 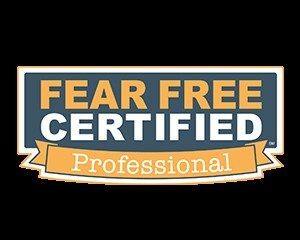 As the only Fear Free Professional Trainer in Northwest PA, it is my goal to create a happier, healthier, fear free life for your pet. I am certified to look out for your pets’ physical well-being who knows how to handle a fearful, anxious, or stressed pet. Owning and raising a dog with fear aggressive behavior issues was frustrating, challenging and at times left me feeling helpless. Our biggest challenge and source of stress was when we had to take our dog to the veterinarian for care. Abby would display all the classic signs of fear – panting, pacing, hiding, lip licking, excessive shedding and always looking for an escape. Once the staff or the veterinarian attempted to approach her, she would begin to freeze, stare into space, snarl, growl and eventually air bite. Everyone was afraid of her which then led to restraining her and sedating her. The advice given to us was to use a prong collar. It wasn’t until Abby was at too high of a stress level, we were instructed to muzzle her. Of course, she began air snapping at us and we were unsuccessful. When I asked if I could muzzle her at home and have her come to the office with the muzzle on, I was told no. Knowing this was our new “routine” for vet visits, we began avoiding going to the vet. We began feeling like we were the family that the veterinarian staff dreaded. Does any of this sound familiar? If so, there is hope and a new initiative in veterinarian medicine. Dr. Marty Becker, developed the Fear FreeSM initiative sweeping veterinary medicine designed to ease the stress, fear, and anxiety so many pets experience while at the veterinarian. The mission aims to “take the ‘pet’ out of ‘petrified’” and get pets back for veterinary visits by promoting considerate approach and gentle control techniques used in calming environments. Utilization of Fear Free methods and protocols leads to reduction or removal of anxiety triggers, which creates an experience that is rewarding and safer for all involved including pets, their owners, and veterinary health care teams. Learn more at www.fearfreepets.com. It was my personal experience with fear aggressive dog and the initiative to move veterinarian visits to fear free that inspired me to begin to train dogs. I knew there had to be a better way to train and work with dogs riddled with fear. I have spent the last two years gaining the professional knowledge and skill set to work with fearful dogs. I also specialize in Puppy classes. I am a Puppy Start Right certified trainer as well as an A.K.C. STAR puppy instructor and evaluator. I am passionate about starting our puppies out on the right “paw”. I believe it is important to teach the desired behavior from the start rather than dealing with unwanted learned behaviors (chewing, jumping, housetraining, etc.) teenage and adult dogs display. Every aspect of our training services provided by Canine Paws-Abilities incorporates humane training methods based on the principles of animal learning theory and positive reinforcement. Whether you choose group or private lessons, we offer training and coaching that allow for practical application in your everyday life which ultimately strengthens the canine-human relationship. We are committed to providing dog owners with practical tools and education to make their training goals “Paws-able”!